WestJet has unveiled its newest marketing video, #WestJetSeatCity, in partnership with the Las Vegas Convention and Visitors Authority (LVCVA). 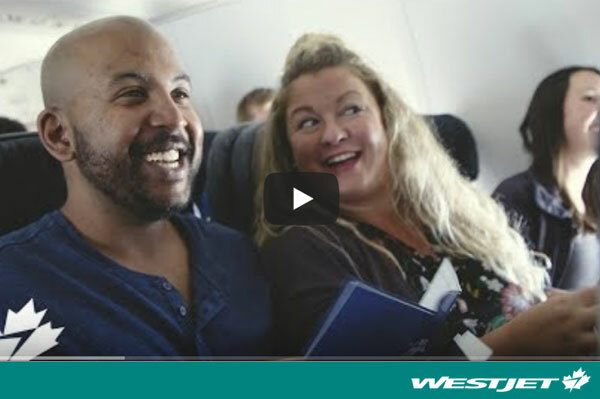 As the international airline with the most seats to Las Vegas, the #WestJetSeatCity video illustrates three exclusive experiences provided to three couples from Flight 1116 on April 30. In it, the selected couples seek out their WestJet “seats” somewhere in the city to get a front-row view to adventure including controlling the Fountains of Bellagio, taking centre stage at Cirque du Soleil and getting closer than ringside at a UFC fight. To watch the video, click https://www.youtube.com/watch?v=_x1sAQZEXZQ&feature=youtu.be. #WestJetSeatCity is the second experiential campaign the airline has partnered on with the LVCVA and Rethink. Last year WestJet’s Las Vegas Desert Lights video received two Guinness World Records for spinning the world’s largest LED wheel in the desert outside Las Vegas.